COPENHAGEN, Denmark (CelebrityAccess MediaWire) — George Michael can still draw a crowd. The former frontman from Wham! started a solo tour in September that's been SRO just about everywhere it goes. He played at Parken National Stadium in Copenhagen on November 11, beating U2's previous attendance record of 49,200 as more than 50,000 fans jammed into the field. Parken has been somewhat controversial in the Danish press. Originally opened in 1992, the football stadium had been panned by critics for having poor acoustics and seating arrangements. 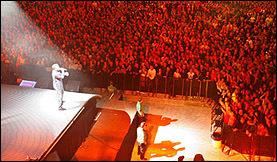 The Eurovision Song Contest was held there in 2001 and as a consequence, a number of improvements were made to the facility, including acoustical design improvements, more seating and a retractable roof.